Publisher's note: This coloring book has also been published in the UK, under the title Snowflake, Seashell, Star and in somewhat different form. 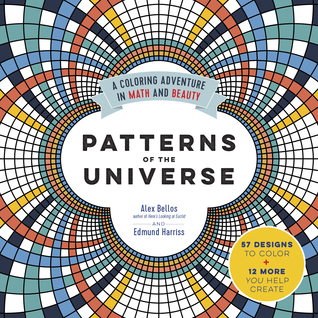 Patterns of the Universe is the North American edition. Alex Bellos is the author of Here’s Looking at Euclid and The Grapes of Math, which are both bestsellers and have been translated into more than 20 languages. He writes a math blog for the Guardian, which has had more than 7 million page views in the past year. His YouTube clip about the mathematically optimal way to cut a cake has had more than 11 million views. He lives in London. Well it seems that coloring books are not going away! The coloring for adults is on the rises and taking everyone by storm! I fell in love with this book when we found it at #BEA and well sorry guys we only grabbed one copy each and each of us is hoarding it so no giveaways for this one. But its a great book to pick up. Each page is filled with some great patterns and then info on the left page. So you get some knowledge and you get to color! Best of both worlds!